Book Author of “The Value of Nothing” and “Stuffed and Starved”. Raj Patel has worked for the World Bank and WTO and been tear-gassed on four continents protesting against them. Writer, activist, and academic, he is currently a visiting scholar at UC Berkeley’s Centre for African Studies, a researcher at the School of Development Studies at the University of KwaZulu-Natal, and a fellow at The Institute for Food and Development Policy, also known as Food First. 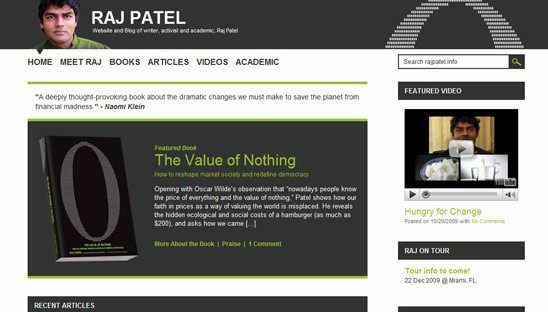 Picador hired us to create a website so Raj can have a site that shows all his published books and also to express himself with blog post. This wordpress site is mainly designed for a blog 1st and website 2nd. We included a book section, events section (using the events plugin) and a video section.